The court reporter will prepare a transcript which will be forwarded to the parties by the Township Solicitor. Upon receipt of the transcript, the parties will have 30 days to submit their "findings of fact and conclusions of law" to the Board of Supervisors for their review. The Board of Supervisors will then have 45 days to prepare its written decision. The decision of the Board of Supervisors will be rendered at a public meeting--the date of this meeting has not yet been determined. Additional public hearing video is now online below. The hearing has been continued to February 21 at 9:00 AM. Additional public hearing video is now online below. The hearing has been continued to January 22 at 9:00 AM. Board of Supervisors of East Brandywine Township will conduct a public hearing on Tuesday, January 15, 2019 at 9:00 a.m., prevailing time, at the East Brandywine Township Building located at 1214 Horseshoe Pike, Downingtown, Pennsylvania 19335 as a continuation of the public hearing that was held on December 12, 2018 to consider and hear testimony concerning the Preliminary/Final Land Development Application and Preliminary/Final Land Development Plans submitted by Carlino East Brandywine LP for a proposed shopping center to be developed on property owned by the Applicant located at 1279 Horseshoe Pike, Downingtown, PA, more particularly described as Chester County Tax Parcel No. 30-5-227. As part of Applicant’s proposed development it also intends to construct a portion of a proposed road, sidewalk, guiderail, stormwater management facilities, fence, sanitary sewer line and other minor improvements on a 1.972 acre parcel identified as a portion of Chester County Tax Parcel No. 30-2-47 and a right-turn lane and signage on a 0.069 acre parcel identified as part of Chester County Tax Parcel No. 30-5-226 (collectively the “Township Parcels”). On August 14, 2018, the Pennsylvania Commonwealth Court denied the Application of BVA and L&R for re-argument of the condemnation decision issued July 2, 2018 (see update dated July 13, 2018). BVA and L&R now have thirty (30) days to file Petition with the Pennsylvania Supreme Court requesting it accept an appeal. The Township also just learned that the United States District Court of the Eastern District of Pennsylvania on August 7, 2018, entered an indefinite stay in the pending anti-trust case to allow the state courts to resolve the remaining land development, tort and condemnation cases. In effect, this puts the anti-trust case on hold until the other matters are concluded. On July 2, 2018, the Commonwealth Court entered an Order affirming the Order of Judge Griffith of the Chester County Court of Common Pleas dismissing the objections filed by BVA and L&R to the condemnation of easements and land necessary for the construction of a new Connector Road between US Route 322 and North Guthriesville Road. The Commonwealth Court divided the BVA/L&R objections into three (3) categories: (1) an assertion that the condemnation is not for a public purpose and/or is excessive; (2) an assertion that the condemnation is procedurally flawed; and (3) an assertion that the connector road is illegal and/or is administratively barred from construction. The Opinion quotes extensively from the Decision of Judge Griffith, concluding that none of the objections had merit. A full copy of the Opinion is available here. BVA/L&R have thirty (30) days to file a request for review by the Pennsylvania Supreme Court. The Pennsylvania Supreme Court has the right to either accept the case or refuse to accept it. If the Pennsylvania Supreme Court does not accept an appeal there are no further state court appeals available. A party may request review by the United States Supreme Court. The United States Supreme Court has the discretion to accept or refuse to review cases. It generally accepts very few cases. This is only one facet of a very complex situation. 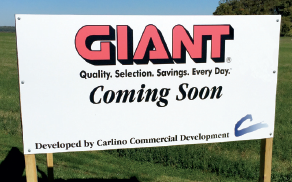 Carlino recently filed a fourth Plan for the Giant with the Township. A complete copy of the Decision and Order are available here. On September 7, 2017, the Honorable Edward Griffith issued a decision in the condemnation action filed by the Township in 2014 to condemn certain land and easements in order to construct a connector road from Route 322 Horseshoe Pike through to North Guthriesville Road. Brandywine Village Associates (“BVA”), the owner of the existing shopping center, and L&R Properties, the owner of the property to the rear of the shopping center, had initially filed over 35 preliminary objections to the condemnation action and later added an additional objection prior to the hearing. After two years of delay and then seven (7) days of hearings on BVA’s objections to the condemnation, Judge Griffith concluded that the preliminary objections had no merit and overruled all of them, dismissing the challenge. A full copy of Judge Griffith’s Decision is available here. Following Judge Griffith’s ruling, on September 21, 2017, the Honorable Ronald C. Nagle issued another Decision in the series of pending cases arising from the Giant land development. Back in 2011, BVA filed a lawsuit against Carlino, the developer attempting to construct the Giant store, and various members of the Watters family, which still owns the land, requesting the Court interpret the various easements on the Watters land created to facilitate construction of the BVA shopping center, in a manner that would prohibit the construction of the Giant. Judge Nagle concluded that the arguments made by BVA had “no merit” and dismissed their Complaint. A full copy of the Decision is available here. The twenty-three (23) page Decision provides a comprehensive background on the controversy, including the fact that the sewer easement was now unnecessary because the easement specifically required BVA to connect to the municipal sewer system when it became available. Since BVA was now connected, there was no further need for the sewer easement. Judge Nagle also referenced the recent decision of Judge Griffith dismissing the objections of BVA to the condemnation of the remaining stormwater and access easements. On July 18, 2017, the Honorable Senior Judge Nagle issued an Opinion in the Third Land Use Appeal filed by Brandywine Village Associates (BVA) and L&R Partnership (L&R) for the East Brandywine Center project. Carlino East Brandywine (Carlino) is the entity attempting to construct a Giant grocery store, a bank, and other shops. This Opinion involved the third and most recent Preliminary Plan submitted to and approved by East Brandywine Township Board of Supervisors. The full text of the Opinion is available here. On April 20, 2016 the Board of Supervisors granted preliminary approval of this third plan. Final approval was granted subsequently granted on June 21, 2017. The Opinion recites the long history of this matter quite eloquently so it will not be repeated here. The thirty-six (36) page Opinion in meticulous detail discusses every issue raised by BVA and L&R and concludes that the “...Board did not err in approving Carlino’s Plan for the 'East Brandywine Center' [Giant]..."
As indicated above, the BOS has since granted Final Plan approval to Carlino on this third plan. BVA and L&R have filed an appeal of this Final Plan approval to the Chester County Court of Common Pleas as well. On January 6 the Honorable Ronald Nagle, Senior Judge of the Chester County Court of Common Pleas, issued an Opinion and Order in the pending appeal of Brandywine Village Associates and L & R Partnership to the second Preliminary Plan filed by Carlino East Brandywine LP for the construction of a Giant store. A complete copy of the Opinion and Order are available here. The thirty-five (35) page opinion addresses each of the issues raised by BVA and L & R and concludes either that the Township handled each issue appropriately or BVA and L & R waived consideration of the issue. Still pending before the Court is an appeal from the third plan submission, in which the Township granted Conditional Preliminary Plan approval on April 20, 2016. BVA and L & R have raised many of the same issues addressed by Judge Nagle in his opinion of January 6 with respect to this third plan. At the Board of Supervisor's regular meeting on January 18, the Board will consider a request by BVA and L & R to hold additional public hearings prior to making a decision regarding Carlino East Brandywine LP’s application for Final Plan approval of this third plan. Also pending before the Court of Common Pleas are BVA and L & R's objections to the Township's condemnation of certain easements and land for a connector road and Declaratory Judgment actions between Carlino and BVA concerning easement rights held by BVA. The Chester County Court of Common Pleas recently lifted the stay entered on August 22, 2016 which prevented the Township from moving forward with its review of the application of Carlino East Brandywine LP for the proposed Giant. The Township Solicitor has notified all the relevant parties that the Township will now continue with the consideration of the pending application for final plan approval of the pending development plan. The Chester County Court still has under consideration appeals by Brandywine Village Associates and L & R Partners to the 2nd and 3rd Preliminary Plan approvals previously granted by the Board of Supervisors and an appeal by Brandywine Village Associates and L & R Partners to the condemnation associated with the proposed new road connecting North Guthriesville Rd and US Route 322. A hearing in the condemnation matter scheduled for January 2017 was continued by the Court at the request of Brandywine Village Associates to March 2017. In addition, in December 2016 Brandywine Village Associates and L & R Partners filed a new lawsuit in federal court concerning the proposed Giant development. The law suit alleges that the Township and Carlino East Brandywine LP violated federal anti-trust laws, among other issues. Township attorneys have filed a motion to dismiss the Township as a party which they hope to have heard by the Court soon. In response to a “Petition to Stay Proceedings” filed by L&R Partnership and joined by Brandywine Village Associates, the Court of Common Pleas of Chester County has prohibited any further consideration of Carlino East Brandywine’s Final Land Development Plan by the Township’s Board of Supervisors and Planning Commission. The stay of proceedings is in effect until the Court orders otherwise. Carlino East Brandywine LP has elected to pursue obtaining Final Plan Approval from the Board of Supervisors even though the Court of Common Pleas for Chester County has not yet ruled on Brandywine Village Associates and L&R Partnership’s appeal of the Board’s April 20 decision granting Conditional Preliminary Plan Approval. On August 3, the Planning Commission recommended that the Board of Supervisors grant Final Plan Approval with conditions. Brandywine Village Associates and L&R Partnership have requested that the Board of Supervisors hold hearings prior to rendering a decision on the Final Plan Approval, similar to the many days of hearings that preceded the Board’s Conditional Preliminary Plan Approval in April. At the August 17 Regular Session (7:30 PM) the Board will consider the request for additional hearings and, if Carlino East Brandywine LP is prepared to request it, may also consider granting Final Plan Approval. If granted by the Board of Supervisors, the same parties may also appeal Final Plan Approval to the Court of Common Pleas. While the developer could elect to begin work at the site with Final Plan Approval in hand, so long as the Court has not ruled on the outstanding appeals they would do so at their own risk. Brandywine Village Associates and L&R Partnership have appealed the conditional preliminary plan approval granted to Carlino East Brandywine LP by the Board of Supervisors to the Court of Common Pleas. The matter is now in the hands of the Court of Common Pleas for Chester County, who will make a decision to either confirm the approval granted by the Township or reject the approval. Full text of the Board of Supervisor's conditional preliminary approval of the plan of Carlino East Brandywine LP can be found here. At its regular meeting held on Wednesday, April 20, the East Brandywine Township Board of Supervisors granted conditional preliminary approval of the plan of Carlino East Brandywine LP for the “East Brandywine Center,” which features a Giant supermarket. At the same time, the Board granted a number of waivers as requested by the applicant. Parties now have a period of 30 days in which to file an appeal pursuant to the Pennsylvania Municipalities Planning Code. The Board heard testimony on Thursday, April 14 from 9:00 AM to 3:00 PM. All three parties finished testimony and have made closing comments. The Board Supervisors will render a decision on the preliminary plan application at its regular meeting on April 20, 2016 at 7:30 PM. The Board heard testimony on Tuesday, March 29 from 9:00 AM to 4:00 PM. An additional hearing date has been scheduled for Thursday, April 14 beginning at 9:00 AM. The Board intends to render a decision on the preliminary plan application at its regular meeting on April 20, 2016 at 7:30 PM. The Board spent an additional four hours hearing testimony on Wednesday, March 16 between 1:00 PM and 5:00 PM. Later that same evening the Board heard comments from a number of residents immediately following their regular meeting at 7:30 PM. An additional hearing date has been scheduled for Tuesday, March 29 beginning at 9:00 AM. The Board spent spent more than five hours hearing testimony on Thursday, March 3. The hearing continues on March 16 at 1:00 PM. The opportunity for residents to be heard will be at the Board's 7:30 PM meeting that same night. Judging by the attendance at the February 17, 2016 Board of Supervisors Meeting, as well as social media activity, there is a great deal of interest in the pending application of Carlino Land Development to construct a Giant grocery store in East Brandywine Township. The Board of Supervisors wants you to know that your opinions and concerns are important. Many who attend the meeting February 17th were disappointed they did not get the opportunity to address the Board of Supervisors. We thought it appropriate to explain the process so residents would understand when they will have the opportunity to be heard. Even though the current application before the Board of Supervisors is substantially similar to the two (2) previous applications that were submitted and approved, legally this third (3rd) application must be treated as if this project had no previous history. In other words, it must go through the land development process. Two (2) opponents (adjacent property owners) have exercised their right under the Municipalities Planning Code to request that the Board of Supervisors conduct a formal hearing on the application. The hearing began on February 17th and will continue on March 3rd at 9:00 AM. The Applicant first presents evidence in support of the Application. The opponents then present their evidence. After all the evidence is introduced the public will be permitted to make comments. It is currently anticipated that the Board of Supervisors will hear public comments at the next evening meeting (March 16th at 7:30 PM) before making a decision. However, that could change if the opponents do not conclude presenting evidence on March 3rd. Check back here for any updates.